Empowering the next generation of talent. Digital Shoreditch is a unique community celebrating the outstanding creative, technical and entrepreneurial talent of the UK, Europe and beyond. They run regular meetups, workshops and hackathons, and deliver enormous festivals to showcase and support the growth of a flourishing creative society. 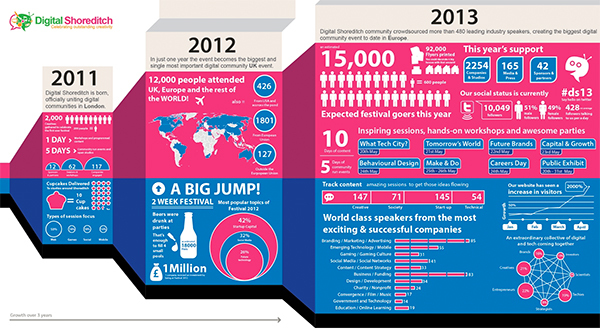 The Digital Shoreditch Festival is a key moment in the year that offers a global platform to the doers, makers, actors and innovators who are growing and enriching this amazing tech ecosystem - those who share powerful ideas and stories, and work towards achieving greater social, cultural and economic impact. With this in mind, this year's festival, which runs for 11 to 24 May, spotlights three focus areas vital to the continued development of creative, tech and digital communities - digital skills, space and incubation, and fast growth. William Hill will be showcasing its prototype for its “Get in The Race” app for Google Cardboard. The app which has been created in partnership with UNIT9 development offers punters ‘a real-life horse race in a 3D virtual environment, “sitting” on the horse they have backed and watching every twist and turn from the jockey’s point of view’. William Hill will further launch its public developer site and API program – WH Labs which aims to open up William Hill development functionalities for features such as integrated odds, log-in mechanisms, bet placements and interface functionalities. The site will feature technical information, documentation and test areas for sports betting development, which William Hill hopes will foster innovation and by opening collaboration with the technical community.